We have just arranged for a document from the Non-Stop Picket to be reproduced in a South African politics textbook. The book, Politics: A Southern African Introduction (by Joleen Steyn Kotze, David Welsh, Xolela Mangcu, Nicola de Jager, Vicky Graham, Thabisi Hoeane, Aubrey Matshiqi, Vusi Gumede, and Theo Neethling) will be published by Oxford University Press Southern Africa in March 2015. It is an introductory textbook aimed specifically at first year Politics and International Relations students attending South African universities. 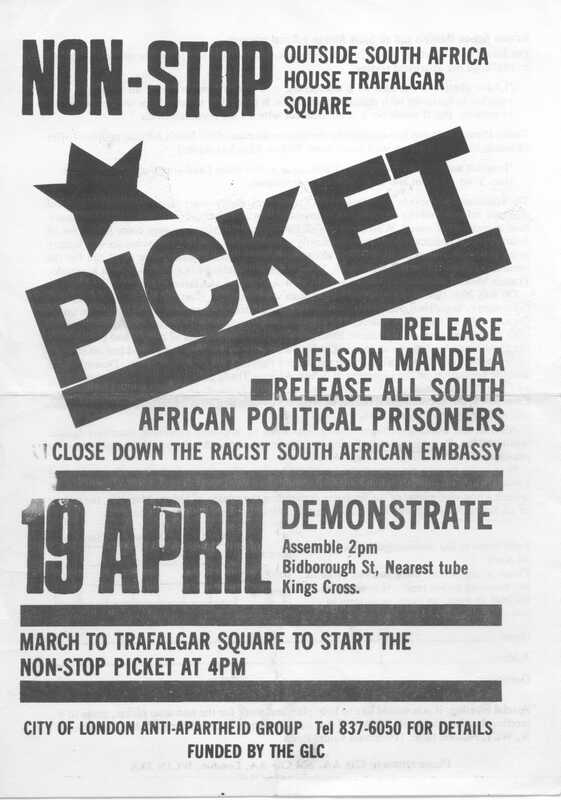 The image they will reproduce is the original leaflet used to publicise the launch of the Non-Stop Picket in April 1986. It will be interesting to see how they frame the Non-Stop Picket and its demands, in the context of the international campaign against apartheid, to their student readers. This entry was posted in Academic, Dissemination and tagged Anti-Apartheid Movement, Aubrey Matshiqi, City of London Anti-Apartheid Group, David Walsh, international solidarity, Joleen Steyn Kotze, Nicola de Jager, Non-Stop Picket, Oxford University Press Southern Africa, Thabisi Hoeane, Theo Neetling, Vicky Graham, Vusi Gumede, Xolela Mangcu. Bookmark the permalink.